For the most part, the fact that iPad apps always run full-screen works pretty well. After all, it makes it easier to focus on the task at hand, and in a sense, it effectively turns your iPad into the app you're using. But it's not for everyone, and there may be times where you want to be able to see two apps at a time. Enter Quasar. Quasar is a window manager for the iPad that lets you run individual apps within windows--sort of like how apps on your PC or Mac behave. For instance, you can work on a document in Pages but still be able to peek at a webpage you have open in the background. Quasar lets you close apps, view them in full-screen mode, or resize the window they appear in (though the apps just appear to scale to fit the window--you can't actually view more or less information by resizing). 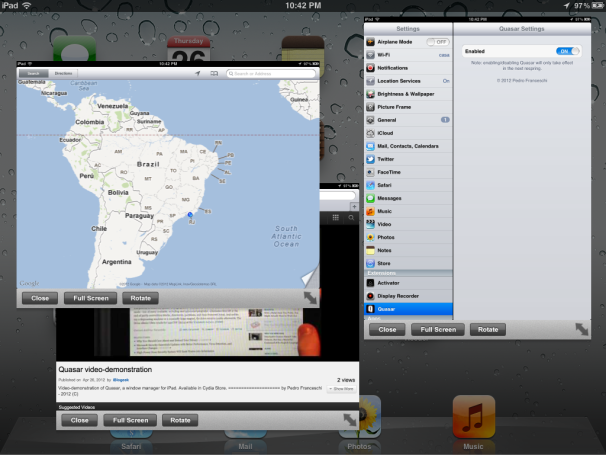 You can also rotate between landscape and portrait views. Quasar only works on jailbroken iPhones, and you can buy it via the Cydia store for $9.99. If you give it a try, let us know how it works!